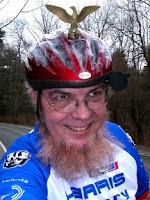 commuterDude: The Great Teacher lay silent. The Great Teacher lay silent. It is with heavy hearts that we convey to you the news that Sheldon Brown has passed away. Our thoughts go out to his family at this time. The cycling community has lost one of it's most passionate members. I actually got the treat of talking at length with Sheldon Brown on the phone once, and while I was probably one of hundreds that he spoke to that day, it was pleasureable, informative, and he took something like ten minutes talking with me about something so trivial I can't even recall what question I had at the time. It was probably something I was over-thinking, but he was patient and as enthusiastic about the possibilities as I was. I feel lucky to have spoken with him, probably the most prolific cycling enthusiast and writer of our time. There was no-one more passionate, more skilled, more helpful - he will be dearly missed, indeed. Nearly everything I know about cycling theory, science and practice I learned from his webpages. May those writings live on as a testament to his legacy, forever. Rest in peace, great teacher.